View of the interior of Aghia Sophia. In the foreground, the chandelier that hangs from the dome of the church. Thessaloniki through ten of its most beautiful and historical structures. Thessaloniki is a city rich in texture. Through history, this stunning and strategically placed city has been much admired. Saracen pirates, Crusaders and Venetians are among those who came and went. But it was the three vast empires of the Romans, Byzantines and Ottomans that embraced the city, each leaving an enduring mark. Home to the three great monotheistic faiths over the centuries, the city has remained loyal to its cosmopolitan pedigree. Thessaloniki has performed admirably as a city on the crossroads of history, representing a thriving and largely harmonious multiethnic society. The Greeks and Ottomans were joined by a large settlement of Sephardic Jews at the end of the 15th century, who would form one of the largest Jewish communities in southern Europe. The 10 landmarks described below are among the best examples of the city’s sacred and secular architectural heritage, representative of the city’s history, social diversity, and noted architects. Almost all of the structures continue to play a vital role in the daily life of the contemporary city. The emblematic Rotunda, completed at the beginning of the 4th century on a commission by Roman Emperor Galerius and later altered to become a Christian church. In a city of labyrinthine intricacy, this vast, unobstructed interior is unique. 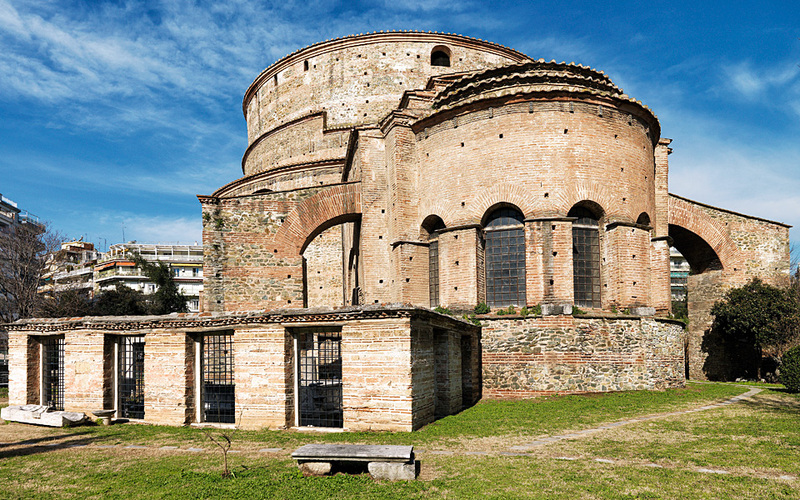 The Rotunda, as emblematic of Thessaloniki as the White Tower or Aghia Sophia, was the main building of the Galerian complex, completed together with the Arch of Galerius at the beginning of the 4th century on the commission of Roman Emperor Galerius. Thought to be intended as his mausoleum, but never used for this purpose, the Rotunda was consecrated and altered to become a Christian church later in the same century. One of the eight grand arches was converted into a niche and a sanctuary was added, whose apse has retained its original fresco. The wide arches are decorated with elaborate mosaics of geometric and naturalistic designs inspired by birds, fruit and flowers. Each is unique, and they remain largely intact. Earthquakes have taken their toll on much of the dome’s mosaics, but the astonishingly thick walls (over 6 meters) have kept this soaring 30-meter ceiling aloft through the centuries. This is a monumental space that is both inspiring and inviting. The mosaics are currently being restored, and the space is often entirely empty, making you feel like you’ve stumbled onto a hidden treasure. Crypt of Saint Demetrios, in the church dedicated to the martyr. According to tradition, this is where Demetrios was imprisoned, put to death and buried. If you are a light sleeper and ever find yourself in Thessaloniki on 26 October, you may be roused from your slumber at the crack of dawn by a military marching band. They’ll be celebrating the anniversary of the city’s liberation, which happened on the feast day of Thessaloniki’s patron saint, in 1912. St Demetrius of Thessaloniki and the magnificent 7th-century basilica dedicated to him hold a very special place in the city’s heart. 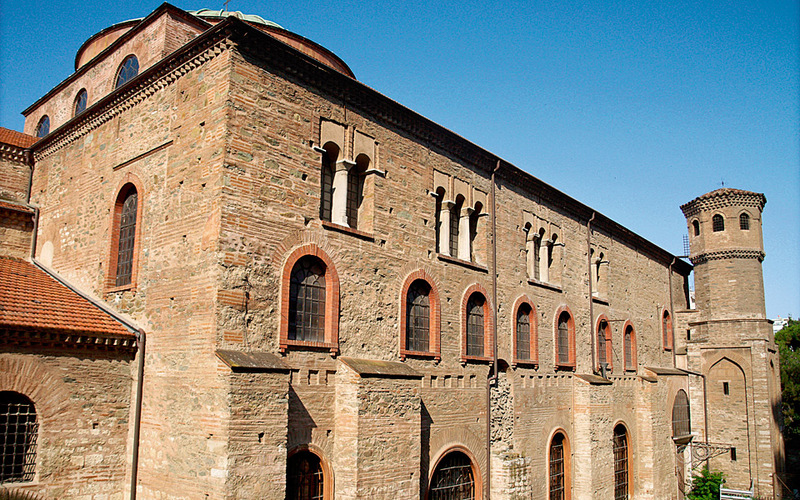 The church is built on the site of a smaller, 4th-century chapel that housed the saint’s remains. The layers of history are not just a matter of record – they can be seen in the reuse of structures like the columns. They are of varying height because they have been recycled, for the second or even third time, from earlier Roman monuments. The capitals are, likewise, from older structures and are arranged to make them all line up at the top. 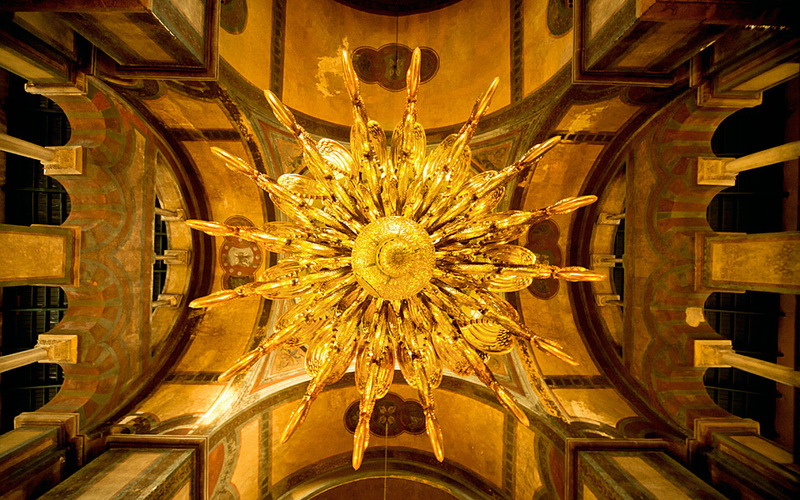 The soaring nave and intricate mosaics that have survived 14 centuries truly inspire. 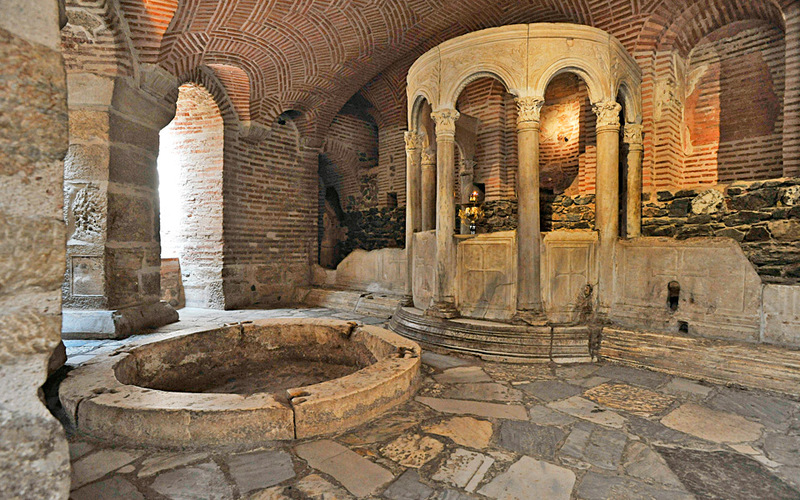 But perhaps the most sacred and intimate space of all are the catacombs beneath, the site of the martyrdom of St Demetrius and a source of holy water. A series of five chambers and arched corridors are filled with mystery and shadow, light and spirituality. Rear of the Church of Aghia Sophia. 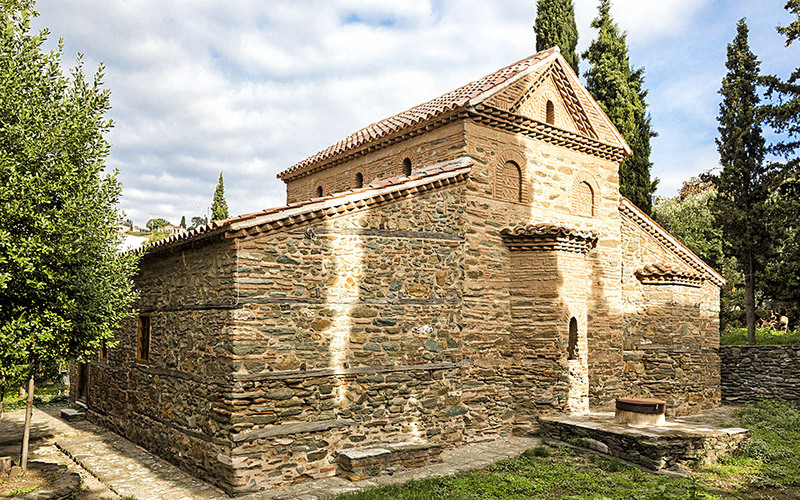 Based on its grand predecessor in Constantinople, the 8th-century Aghia Sophia, with its complex, rhythmic interior, is truly the queen of churches. This is the city’s heart; a spiritual oasis. Starting in the multidomed narthex, the entire surface, apart from the grand mosaics, is painted in cool, rich jewel tones of deep turquoise, lush forest green and garnet, to create a palate of contemplative calm. In addition to the beautiful geometric patterns and designs from nature, look for the trompe l’oeil marble on the lower portions of the walls. Like Aghios Dimitrios, Aghia Sophia was built on the site of an earlier church and incorporates elements of this previous structure – the capitals, lively with swirling, wind-blown acanthus leaves, date from the 5th century. The mosaics reflect two opposing theological points of view. The oldest of the mosaics (8th century) is iconoclastic – a stunning simple blue cross on a gold background. The iconodules eventually prevailed, covering over another simple cross on the apse in the 11th or 12th century with the Virgin and Child we see today. The most animated of the mosaics is on the dome – the Ascension of Christ, surrounded by Mary and the Twelve Apostles, each with his own unique expression of admiration and awe. Majestic. The exterior of Saint Nicholas the Oprhan's church betrays little of the beautifully well preserved frescoes inside. For those who like to explore, Thessaloniki opens up like a secret. To happen upon this wild and flourishing walled garden, complete with doves and turtles and hidden among the charming cobblestone alleys of Ano Poli (the Upper City), is to feel that rush of discovery. Entering the church in the middle of the garden is like stepping back into the 14th century – isolated among its trees and off the beaten tourist path, it is untouched by time. The church of St. Nicholas the Orphan is among the most intimate of the city’s sacred spaces: thick-walled and just light enough to allow one to admire the beautiful murals preserved in their entirety. These do much to enhance the atmosphere of sacred intimacy: the style of the Palaiologan period is characterized by rich deep color and an engagingly narrative approach. The Marriage at Cana is depicted with particularly wonderful expression and immediacy. As with both Agios Dimitrios and Agia Sophia, the church incorporates elements from older structures: in this case, early Christian pilasters with their beautiful acanthus leaves. The high stone walls contain a world unto itself. Indeed, during the centuries of Ottoman rule, this structure remained in Christian hands. Alaja Imaret harks back to Thessaloniki's strong multicultural influences through the ages. This 15th-cenury Ottoman mosque touchingly takes its name from both its appearance and its function. Alaja (or multicolored) refers to the diamond-shaped stones that once decorated the minaret, and imaret means “house of charity,” a primary function of the mosque. The exterior, which is plain but for three elaborate muqarnas–like niches (stylistically they are versions of the mihrab at the end of the second chamber, closest to Mecca), gives little hint of the splendor of the interior. A magnificently proportioned space with much of the original ceiling painting intact, it is rich with intricate, arabesque decoration in both of the domes, with patches of ornate, well-preserved calligraphy on the walls. Where decoration elsewhere has been lost to time, the purity and starkness of the white that has replaced it serves to offset the sumptuous beauty of the remaining designs. Elaborate niches adorn the four corners beneath the dome. 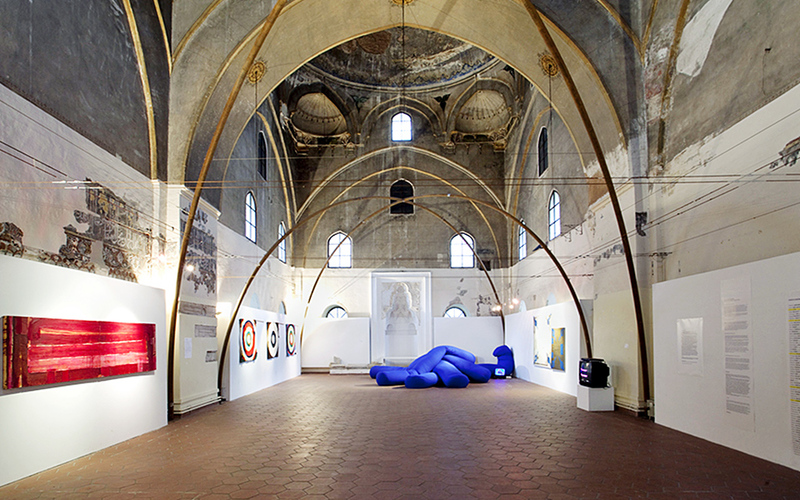 The imaret is now used for exhibitions, many of them site specific, all celebrating the unique character and history of the space. Villa Kapandji has, at various times in its history, housed a Greek Prime Minister, Asia Minor refugees and a school. The Villa of Mehmet Kapandji (1893), a magnificent, neogothic-inspired mansion designed by Piero Arrigoni, has seen – and housed – much of the city’s history. 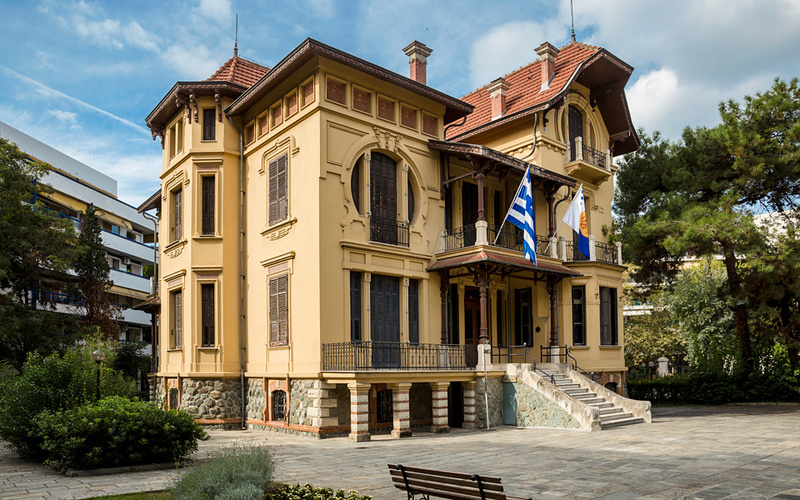 It has served as a residence of Prime Minister Eleftherios Venizelos in the 1910s, accommodation for Asia Minor refugees in the 1920s and as a boys’ high school. It how houses the Cultural Foundation of the National Bank of Greece, which has spared no trouble and expense restoring it to its original splendor. The interior itself, which includes a grand double staircase, intricate metalwork, ornate parquet and elaborate ceiling frescoes, is as worth visiting in its own right as the stellar exhibitions the villa hosts in its grand, yet intimate, rooms. Note that Arrigoni also designed a villa for Ahmet Kapadji, Mehmet’s brother. This whimsical, eclectic fairytale of a building is just a little farther down the street on the other side, at 105 Vasilissis Olgas. Yeni Tzami (New Mosque) is one of the city's finest reminders of its place as a cultural crossroad. The entrance to the Yeni Tzami – a Moorish, keyhole-style arch – gives this mosque a strong Islamic identity. The Corinthian columns supporting the arch tell a more complex story: the architectural eclecticism that characterizes many of Thessaloniki’s fin de siècle buildings is an apt visual metaphor. Thessaloniki was a cosmopolitan jewel with a rich multicultural identity. Vitaliano Poselli (architect of many of the city’s most inspired structures, such as the Villa Allatini and the Allatini Mills, Banque de Salonique and Ottoman Imperial Bank) brought together a host of elements – Moorish, neoclassical, Gothic, Romanesque – in his grand design. 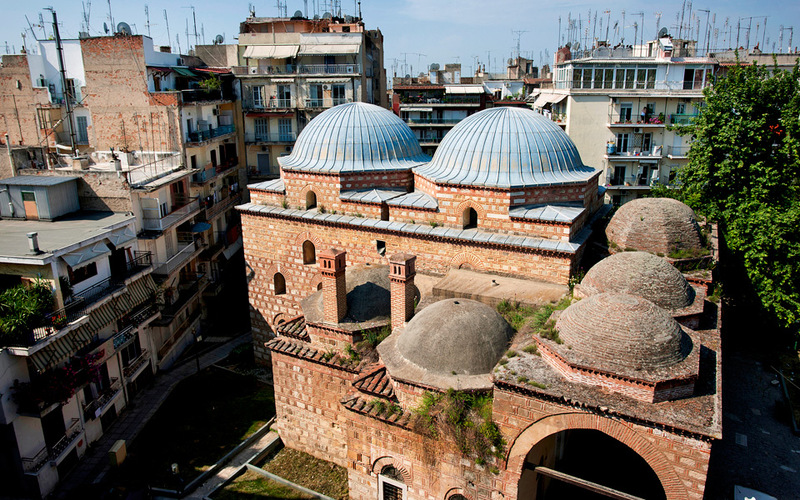 The mosque was built for the Dönmehs – Thessaloniki Jews who had converted to Islam – who made significant contributions to the city’s intellectual life. For many years, the building served as the archaeological museum and its courtyard is still filled with ancient artifacts. The art nouveau mansion of Villa Modiano displays ornate metalwork on the outside of the building. The engineer Eli Modiano built this stunning, art nouveau mansion for his father, Jacob Modiano, in 1906. It has all the grandeur of a palace; apparently the city thought so too – they bought it in 1913 and made it over for the Greek royal family for a time. The villa also served as the residence of the governor of Macedonia, then a military medical school, before becoming the Folk Art and Ethnological Museum of Macedonia and Thrace. The magnificent structure is marked by bold dynamic metalwork and an unusual double loggia that wraps around the front and side, all the better to take advantage of the setting of the building, which is closest to the sea of all the villas. The building is situated at one end of a generous piece of land, a lushly planted oasis enjoying new life as a charming cafe. Eli Modiano is also known for giving the city one of its most enduring structures in 1922 – the roofed Modiano market – as well as the port’s French-inspired Customs House. And if the name Modiano sounds familiar, this is thanks to the 2014 Nobel laureate in literature, Patrick Modiano, a Frenchman who has paternal ancestor’s from Thessaloniki. Thessaloniki's best-known love story originates from the family that lived at Casa Bianca in the early 20th century. 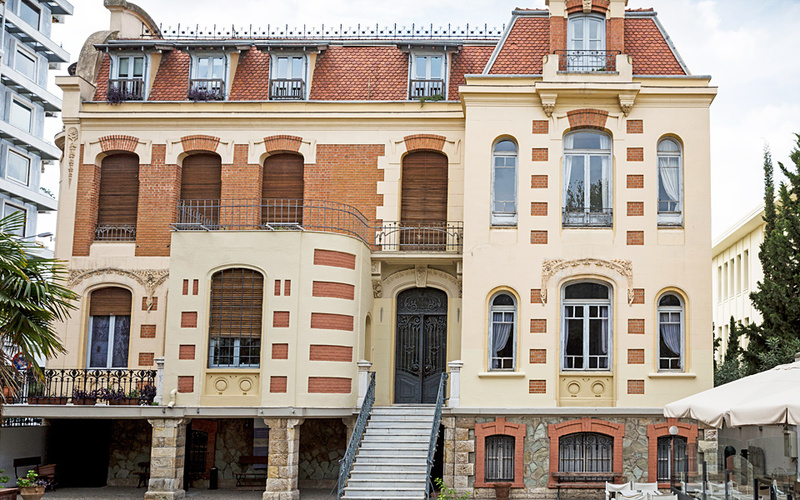 Piero Arrigoni’s art nouveau gem, with its marvelous round windows, has been lavishly restored and now houses Thessaloniki Municipal Gallery. Contemporary exhibitions, a permanent collection and some extraordinary icons are on view; the building and its galleries both are well worth visiting. But many come for its story. Commissioned by Jewish industrialist Dino Fernandez-Diaz, the construction of Villa Bianca (1911–1913) spanned the city’s liberation. It is named after Blanche (Bianca), his wife. Their daughter, Aline, dominated headlines for weeks when she eloped to Athens in 1914 with a Christian, Spiros Alibertis, who was an officer in the Greek army. The couple returned when the scandal subsided and lived here until the mid-1960s, both dying just a few months apart and leaving behind a much beloved story – a true Thessaloniki romance that spanned half a century. 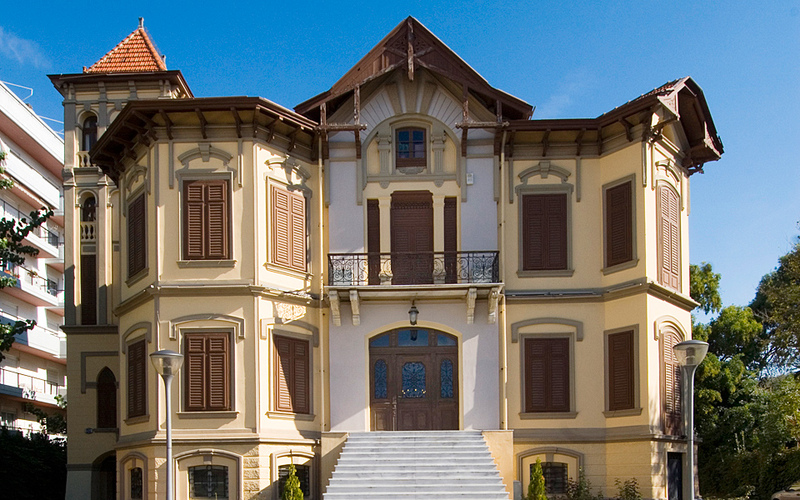 One of the grandest old villas of the city, Alattini Villa & Mills today houses the Regional Authority of Central Macedonia. Sicilian-born architect Vitaliano Poselli gave the city some of its loveliest and most significant turn of the century buildings, both civic and private. Of the mansions of the “Exochon” (countryside) quarter, this villa, built for Charles Allatini, was the grandest. Villa Allatini is notable for its red brick facade and large garden. The building now serves as the Regional Authority of Central Macedonia. As such, the lush grounds are open weekdays, and the villa’s facade, in good condition, is ready to be admired. The interior, long in municipal use, retains hints of its former opulence. 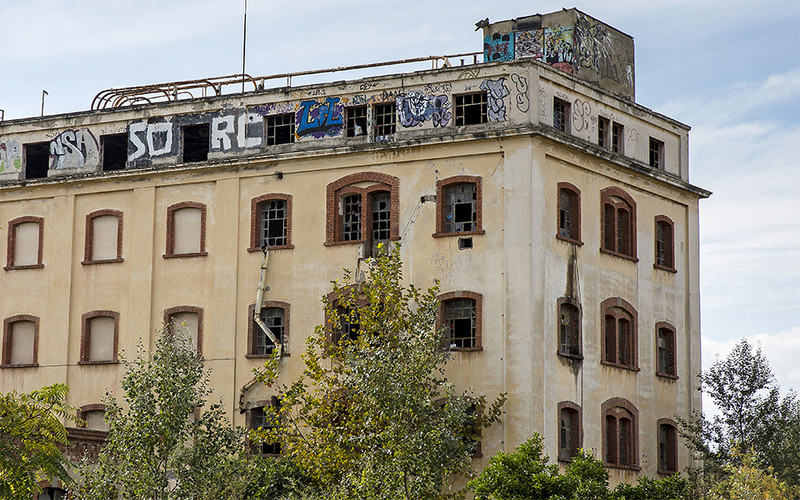 The Allatini Mills, a defining feature on Thessaloniki’s eastern waterfront, are equally beautiful. When Thessaloniki’s first steam-powered mill was destroyed by fire, the Allatini family rebuilt it with style. They again turned to Poselli to design what was referred to at its 1900 inauguration as “the largest mill in whole of the Orient.” These graceful industrial structures, abandoned for the moment and overgrown with weeds, have all the noble presence and beauty of a ruin.